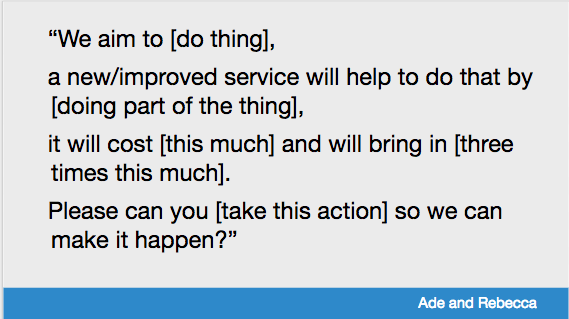 Ade Adewunmi and I recently ran a leadership workshop at the Service Design in Government conference. We had a great time doing it. We met an engaged bunch of people, had some really good conversations and got good feedback, so we’re turning it into a training course. Ade explains more about the talk and writes up what she spoke about here. This is the brief version of what I said about leading organisations. You don’t need to be a visionary to get your organisation to support your project. But you do need to be able to explain what you want to do clearly, and show why it helps the organisation achieve its goals. It’s best to do this in language that appeals to the person that you’re talking to at the time. For example, stress the financial benefits when you’re speaking to a senior manager who prioritises efficiency savings above everything else. This might even mean that you don’t talk about user needs, even though they are the most important thing to you. You can use this format to put together a simple explanation of your project. The Service Design in Government group used it to develop some excellent statements about their projects, in about 10 minutes. If you’re reading this post, you probably feel passionately about the importance of user needs. But the people you have to convince of the value of your project might not care about users, and have no organisational pressures encouraging them to care. It can be tempting to get into a theoretical discussion (read: argument) with your stakeholders about the importance of user needs. But that isn’t going to move your project forward. 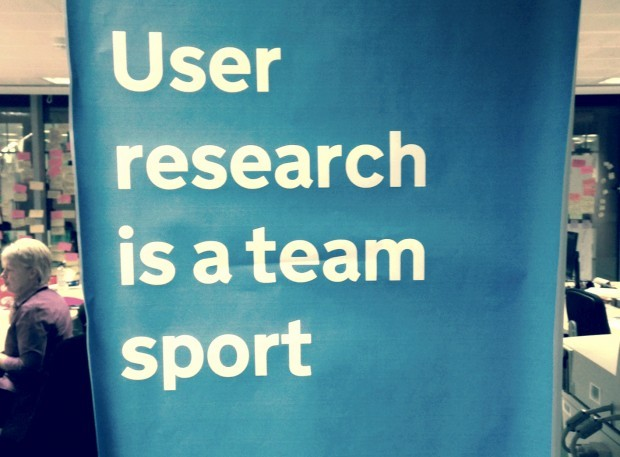 Instead, present evidence about what users need from research and analytics and explain what you want to do to meet those needs (avoiding the words ‘user needs’ if you have to). This makes the discussion more objective. It’s hard for someone to argue against evidence. Don’t keep your work to yourselves. Show prototypes quickly, even if they’re just on paper. Invite people to show and tells. It might take a while but eventually people will show interest. A modest tone works best here. Position your invitation as “we’ve built something and we’d love your input to make it better” rather than “here is the future of your organisation from your colleagues in the digital team”. Which leads me onto the importance of being nice. That’s nice as in “decent colleague”, not as in me telling you that you need to be subservient or feminine. Your project is really important to you, but your colleagues are probably indifferent. That’s ok. You can work with indifference. But you can’t work with hostility. If people don’t like you, they’ll find ways to stop your project. There are two common mistakes (confession: I’ve made both) that are not nice behaviour, and which turn indifference into hostility. Both are easy to avoid. Don’t talk negatively about what came before you, or existing systems/services. This how people often explain why changes need to be made. The argument is basically “what exists is rubbish, my solution will save us all”. But what exists was probably done for good reasons and people generally try their best. Better to assume that and talk about the benefits of your project positively, as I explained in point 1. Don’t be a purist. There’s no good going down in flames shouting “user needs are the only thing that matter”, if your organisation just doesn’t care about them. So talk about your ideas in terms that your colleagues value and can respond to, as I explained in point 2. This work can be draining. You’re driving the project/your discipline, so you have to show enthusiasm and dedication on days when all you want to do is hide under your duvet. Or tell the colleagues who are blocking you what you really think of them. Or bash your head against a brick wall because that feels like a more fruitful activity than talking to the finance team yet again. You need to find ways to look after yourself when work gets hard, and to replenish your energy. Look outside your organisation and establish a network of people you like who do similar work. You’ll be able to share triumphs and failures and learn from each other. You can be more candid that you might be with colleagues within your organisation, and the chances are you face similar challenges. Look outside your work too. I get energy from listening to music and reading. My favourites Sleater-Kinney and Roxane Gay make me feel alive, understood and strong. Watching Corin Tucker dance at 2:33 in this video tells me everything will be ok.
What does that for you? You probably already know. But have you built it in to every day or week? Now you should read what Ade says about leading teams here. Director of Customer Journey @CitizensAdvice. Non-exec @DemoClub and trustee @nationaluglymug. Occasional trainer. Views my own.